Parking: There is plenty of parking at Greve de Lecq, most of the year. In the summer, particularly at weekends you will need to arrive early to be sure of a place. The main car park is about 100 metres back from the beach and easily identified by the Jersey Round Tower in the middle. Most local paddlers avoid parking close to the beach, leaving those spaces for people visiting Colleen’s Cafe. Often people will drop their kayaks close to the slip and then park but it is important not stay there for any length of time as the slip is heavily used. At L’Etacq there are several potential parking areas and I have never known parking to be an issue here. The first is close to Stinky Bay, a slip leads up from the beach and there is parking on the right. It is easy to drive down the slip to load and unload kayaks. The second parking area is close to the German bunker, which is used by Faulkner Fisheries. From this car park it is possible to launch to the north down a narrow slip and through the rocks. It can be quite unpleasant underfoot, to the south it is a fairly straightforward launch across the beach. Refreshments: There is plenty of choice at Greve de Lecq. Colleens Cafe just above the beach is open most of the year. On the slip during the summer months there is a small kiosk, whilst on the eastern side of the bay there is the Romany Cafe, a large cafe largely open in the summer months. There are two bars at Greve de Lecq, The Prince of Wales with great sea views and the more historical Moulin de Lecq. Both serve good food and beer. There is very limited choice at L’Etacq, the fisheries does have limited opening hours for refreshments. There are far more choices available about 5 minutes drive away in St Ouen’s Bay. Heading west from Greve de Lecq the paddling becomes interesting virtually immediately. Once around the remnants of the 19th century pier, granite cliffs start to rise out of the water. Caves break the contours of the cliffs and depending upon the level of the tide they can be explored by kayak. In addition, there are a number of waterfalls, tumbling over the edge of the cliffs in places, the exact number of waterfalls depends upon the amount of rain in the previous days and weeks. 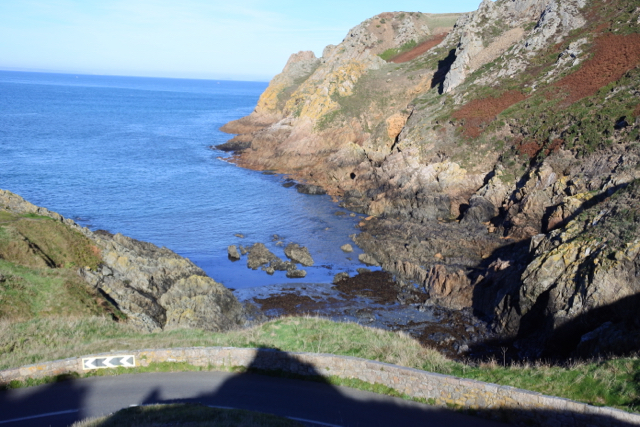 During the early part of the summer there are nesting Puffin’s along this section of coast. Their numbers have fallen dramatically since the 1980’s and 90’s so it is important not to approach too closely, particularly from March until the end of July. The world of birds is never stationary so whereas a sighting of a Peregrine or Buzzard would have been notable 20 years ago, today it would be a reasonably common occurrence. Another bird which has increased in numbers dramatically in recent years, is the Fulmar. They didn’t breed in Jersey until the mid 1970’s but now there are numerous pairs, particularly around Grand Becquet. Often appearing inquisitive as they circle around paddlers on their stiff wings. 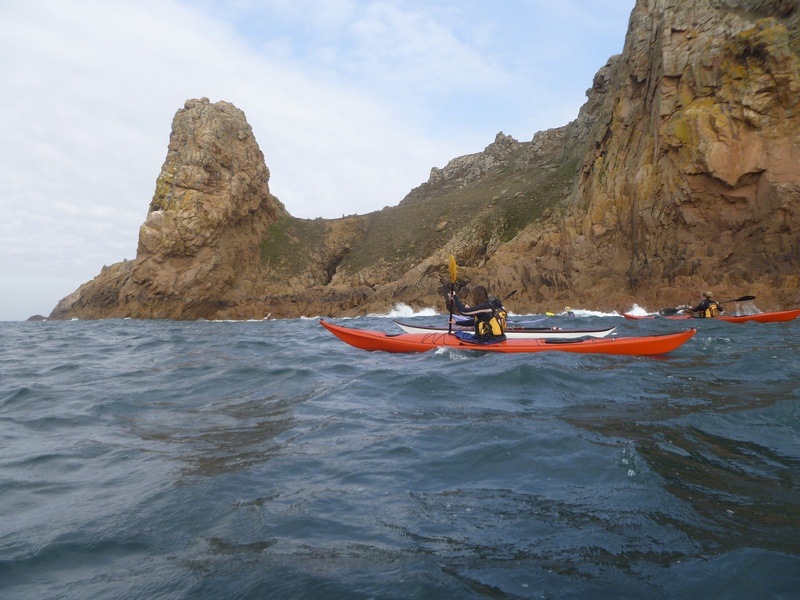 Paddling through Plemont Race on a day when there was a bit of movement. The main headland visible as you paddle west is Plemont. This is an area which, should be approached with caution as a significant tide race develops on the eastern side and northern point whilst the northern point and western side are fully exposed to the Atlantic swell. There is a small beach on the eastern side, so it you have any doubts land and walk along to have a look. It is one of the few places that I know, where it is easy to scout a tidal race in the same way you would a rapid on a river. From about half tide down the beach is uncovered at Plemont, so landing should be relatively simple, that is unless there is a swell. 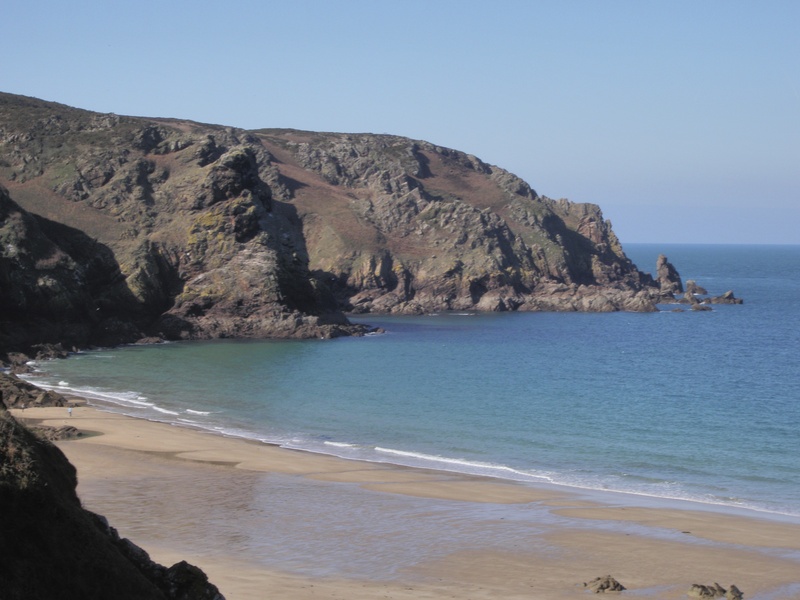 Plemont is one of the best, if not the best, low water break on the Island so care may be needed when approaching the beach, particularly during the summer when there are likely to be people in the water. If wading in the water be aware that there are often weaver fish buried in the sand, so I always keep my shoes on just in case. Looking towards Plemont headland, there is some great paddling in this area when conditions are right. There is a very pleasant cafe at Plemont and public toilets, it is just a bit of a climb up from the beach. In theory you could also get the kayaks up to the cars here, but it would be rather strenuous, so problem really suitable if you are desperate to get off the water. At high water the caves at the rear of the beach can be paddled into and it the water is just right it is possible to get in behind the waterfall, always a memorable experience. Continuing west there are numerous caves, including one about 8 metres above the high-water mark, this is La Cotte a la Chèvre. This Palaeolithic site was first excavated in the early years of the 20th century, with over 200 flints discovered. This northern site isn’t as well documented as La Cotte de St Brelade, close to Ouaisne. The cave was formed when the sea level was higher than it is today and is just one example of the many coastal features formed around the Island during different sea levels, which are encountered when kayaking around the coast. Grosnez really is an imposing location, the lighthouse high on the cliff dwarfed by the scale of the rock architecture. At times it is possible to paddle in close and experience all that the headland has to offer, for example the large jammed boulder under which it is possible to paddle towards low tide. At other times common sense prevails and as the Atlantic swells release their energy on the granite cliffs, you will want to remain well offshore. 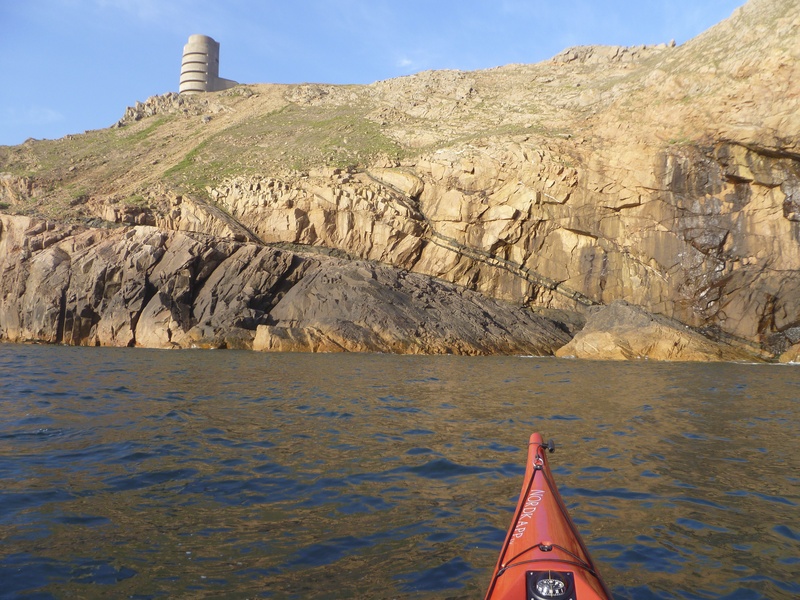 If you are paddling further out to sea the remains of Grosnez Castle can be seen. It was probably built in the 14th Century as a refuge for the people and their cattle who lived in the west of the Island. Today it is in ruins. It is well worth a visit by road and the view from the top when there is a severe westerly gale blowing is truly awe inspiring. From Grosnez the coast turns south and the section between the lighthouse and L’Etacq is reckoned, by many paddlers to be Jersey’s most spectacular stretch of coast but it is somewhere that many of the locals don’t paddle that often because of the frequent swell. So, if it is a calm day and the opportunity arises to paddle this section of coast grasp it with both hands. To the south of the headland there is a small bowl eroded in the cliff, into which it is possible to paddle as long as there isn’t and swell. If it is really calm it is possible to land on the rocks and indulge in the classic Jersey pastime of cliff jumping. There are a number of possible jumping spots and there is plenty of depth of water. To the south you will see the dramatic cliff of La Nethe Falaise, which means “The Black Cliff” in Jersey French. Like its namesake on Snowdon, “Clogwyn du’r Arddu” which also means “The Black Cliff” it offers some superb climbing in a very impressive location. It is one of the largest expanses of rock in Jersey and because of its northerly aspect it very rarely sees direct sunlight. Whatever the conditions this is a very imposing place to sit in a kayak. Sitting under the cliffs of La Nethe Fallaise. The sun rarely shines on this cliff. Heading south there is a never-ending succession of cliffs and rocky headlands. Rouge Nez, marked by the large German bunker on the cliff top, has a tunnel running through it, although it is necessary to land, followed by some scrambling across the rocks and swimming to complete the passage. Just to the south of the headland it is worth landing if possible (swell is nearly always present in this area) and exploring the German guns, which were thrown over the cliff top at the end of the Second World War. Some have subsequently been removed whilst others remain embedded in the rocks. Continuing south one of Jersey’s finest physical features, Le Pinacle, comes into view. It is impossible to mistake it for anything else, so it is pretty much impossible to get lost in this area. 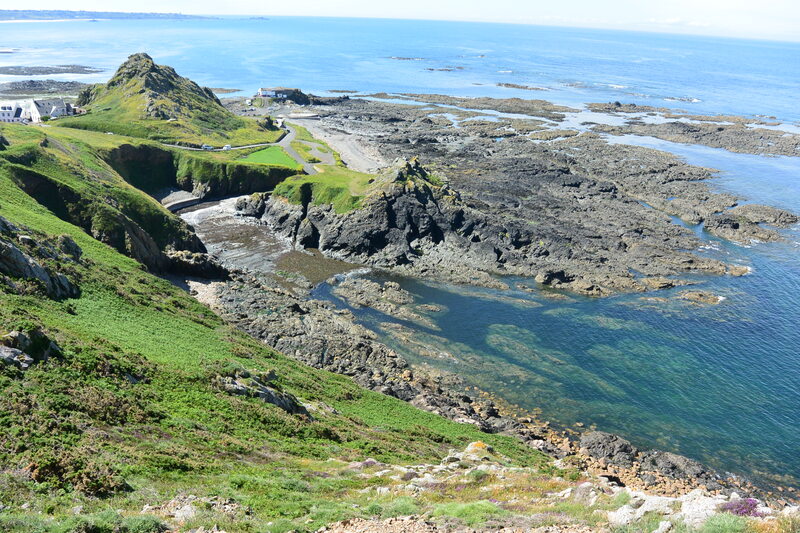 On the col between the stack and the headland are the remains of one of the few known Roman buildings in Jersey but is much easier to explore that area on foot from the cliff path as opposed to scrambling up from the water’s edge. One of the amazing things about Le Pinacle, apart from its size, is that there is a tunnel running underneath it, through which it is possible to scramble. I inevitably go through from south to north. Immediately south of Le Pinacle there is a gully, follow it in, although it might be necessary to swim the first section. Ahead lies a large boulder, scramble over it on the right-hand side, this can be quite tricky and normally requires some co-operation within the group. Looking towards Le Pinacle, from the north. The tunnel running underneath this dramatic stack exits by the bow of the left hand kayak. Ahead there is a large cave, ignore it, our path goes through the narrow dark slit in the left-hand wall. Wading through water, in the dark, is necessary and there is large boulder which blocks your path. There are two options, duck dive underneath, which virtually nobody does, or scramble over the right-hand side. Light now replaces dark and it is a simple matter of carefully climbing over the boulders until you reach the exit on the north side of Le Pinacle. There are two options to return to the south side, scramble up to your right and ten down from the col, the drier option or scramble and swim around the outside of the stack, the easier option. To the south of Le Pinacle, L’Etacq comes into view, the flat-topped bunker clearly visible. On some days the reefs offshore will be a challenging and hazardous location as the North Atlantic swells release their energy is spectacular fashion. There are 3 possible landing places. Keep close to the eastern shore and follow and swells into the small bay straight ahead. Le Pulec, is better known by the locals as Stinky Bay, and with good reason. Decomposing seaweed will normally greet you as you land and be reluctant to let you go, I have seen paddlers have the shoes sucked off their feet by the stinking goo. If there is any swell this is often the best landing spot, despite the small. Towards high tide it is possible to enter the gully in the centre of the reef before taking a channel in a south easterly direction, leading to a small slip just north of the bunker. If the tide is in this is relatively easy option and a short carry to the car park. The third option is to head around the outside of the bunker and land on the sandy beach just to the south. The section of coast that you have just paddled is without doubt one of the finest stretches of coastline in Jersey. Dramatic, entertaining and challenging, all on the same day. It is probably paddled less frequently than any other section of the Jersey coast, partly because of the constant westerly swell. If it is one of those days though when the wind turns easterly and the swell dies down take advantage of your good fortune and head towards L’Etacq for some quality kayaking. Care needs to be exercised in the area of rocky reefs, which run west from L’Etacq. Remember that waves arrive in sets and so what appears to be relatively straight forward can quickly become extremely dangerous in this area. A strong tidal race can occur near L’Etacq, especially just after high water on spring tides when the streams are running north. A significant tidal race develops on the eastern side of Plemont headland. Looking west from the cafe at Plemont, it's rarely this calm. 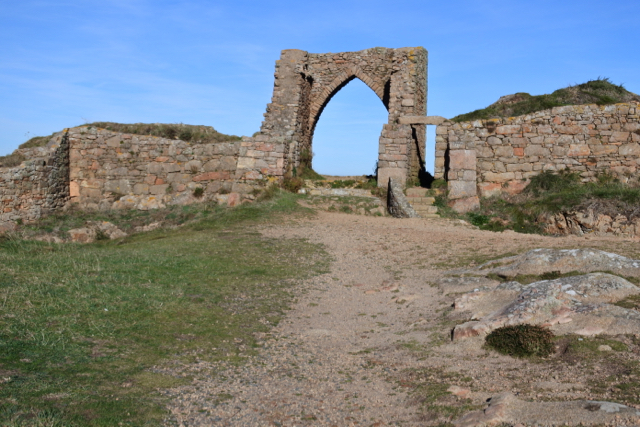 The ruins of Grosnez Castle can be seen, on the cliff top, if you are paddling far enough offshore. 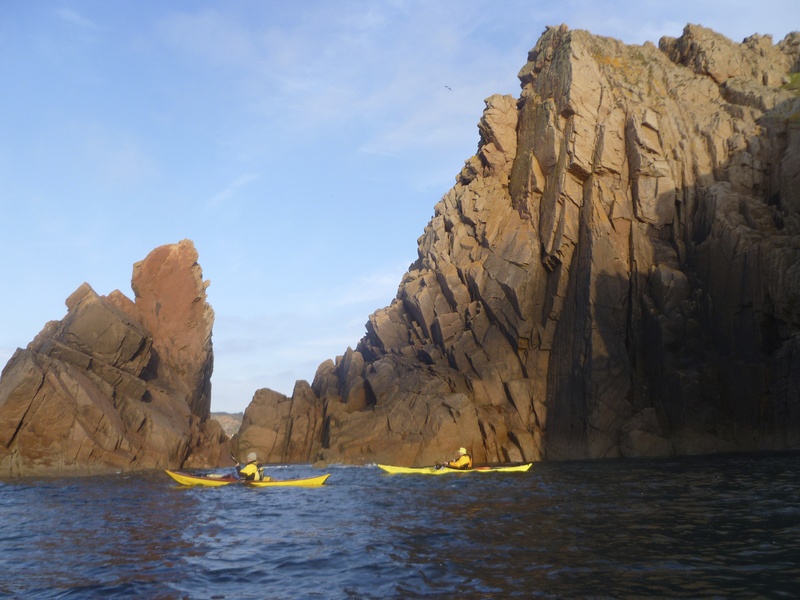 Paddling under the cliffs of Grosnez late on a summers evening, when the light is particularly special. The gun cliffs at Les Landes. The german guns are on the right hand side of the photograph. 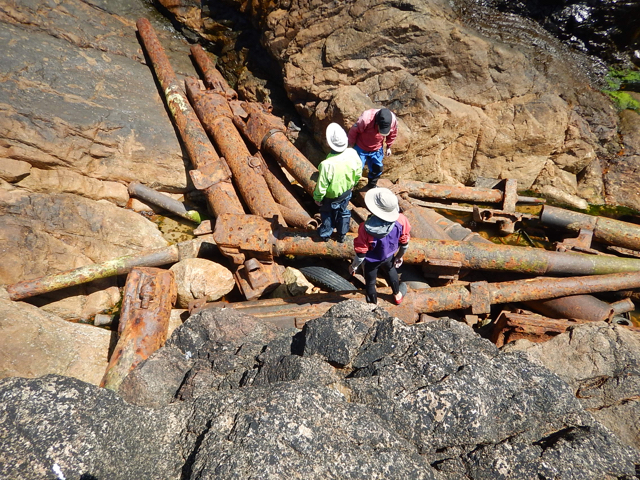 Just a great place to explore, the German guns of Les Landes. Le Pinacle, viewed from the south. The Roman remains are just visible. Looking north from Stinky Bay, on a day when there isn't too much seaweed. The various places to launch and land at L'Etacq are visible, as is the route through the reef.